Barcelona, Nice, Brighton… Berlin? You might not think of the German capital when you’re planning a summer break. The land-locked city is at least a two-hour drive from the nearest coast. 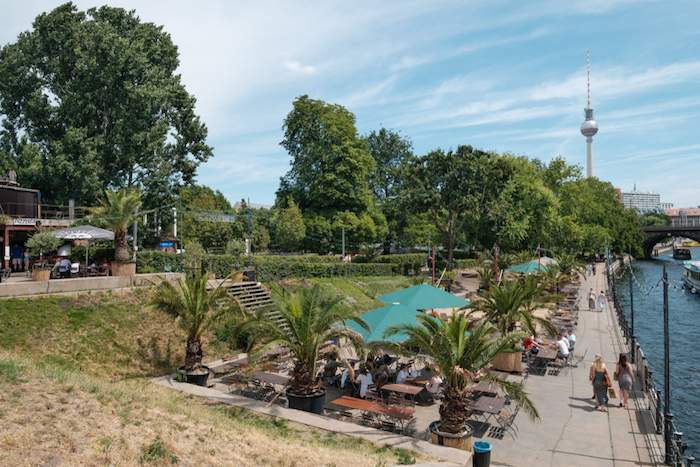 But Berliners are an ingenious lot and have built plenty of summertime spots where you can soak up the laid-back ambiance that envelops the city when the sun shines. From carnivals to lake-like lidos, summer brings a whole new set of activities to any Berlin agenda. Here’s what not to miss. 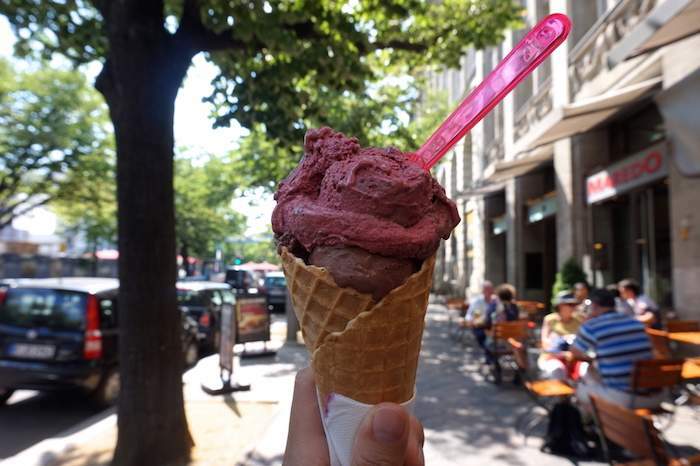 Berlin loves ice cream, and you’ll find plenty of parlours across the city. Hokey Pokey in Prenzlauer Berg always draws the crowds. They have plenty of classic flavours, as well as some more creative combinations. Florida-Eis have been making ice cream since 1927. You can buy their flavours in many places, but if you want to try it in one of their own parlours they have two in Berlin. In Kreuzberg, Aldemir Eis are known for their ice cream sundaes, served in homemade waffle bowls. They’ve also got a delicious selection of ice lollies. The easiest way to cool down in the city? Jumping into a refreshing pool of water of course. And you can even do some sightseeing at the same time, with these creative and beloved swim spots which are tourist attractions in their own right. 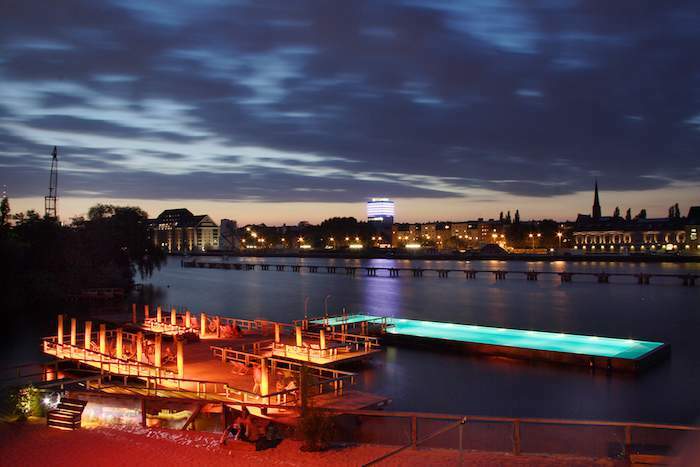 Open from May – September the Badeschiff (bathing ship) is a sparkling swimming pool, floating in a ship in the river Spree. The pool is better for hanging out than laps, with beautiful views of the Oberbaum Bridge and Molecule Man. Meanwhile the land-based portion of the bar offers chilled beach vibes, with deck chairs, cold beers and tunes. If you do want to get some laps in, head for Sommerbad Olympiastadion. This 50-metre open-air pool was built for the infamous 1936 Olympics. It’s still surrounded by the stadium seating and diving tower. Of Berlin’s many local swimming pools, Sommerbad Kreuzberg has reached iconic status. Known to locals as Prinzenbad, it’s been featured in books and films, and becomes a hectic hangout spot at the weekends. Berlin isn’t going to let a little thing like being 200 kilometres from the sea get in the way of a great beach bar experience. You can enjoy a taste of the Caribbean at YAAM (Young African Art Market), which is part art gallery, part bar, set beside the Spree. You can sip Jamaican beer and tuck into jerk chicken while DJs pump out reggae, soca and dancehall. Switch up sea views for sky views at Deck 5 beach. It’s set on the top of a car park, where deck chairs, cocktails and soft sands combine well with the city views and church spires. Strandbar Mitte is the original Berlin beach bar. It’s less beachy these days and has more of a dance focus instead. But the combination of an idyllic location by the Spree, dancing couples and relaxed ambience will still have you feeling you’re on holiday – while you are on your holiday! Berlin is one of the greenest cities in Europe, with many parks worth a trip. This is where you’ll find the locals when the sun shines. Typically gathering friends, beers and a bbq to make a day of it. Tempelhofer Park is the biggest of them all. 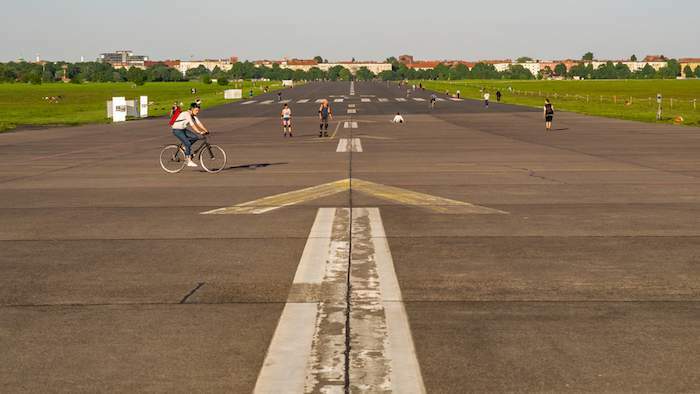 This is the site of the former Tempelhof Airport – you can often see kitesurfers cruising down the former runways. While you’re seeing the sights of Berlin like the Brandenburg Gate and Holocaust Memorial you’ll be walking through Tiergarten. This massive leafy green space dominates central Berlin, the equivalent of New York’s Central Park. Mauerpark is set on a piece of the former border strip that divided East and West Berlin. It’s especially popular on Sundays when it’s host to a big flea market. If things get really heated on your city break, do like the locals do and head for one of the many lakes that surround the city. In the absence of the sea, this is the real place for Berliners to sunbathe, relax and swim! Many of the lakes have paid beach or lido areas, with facilities and lifeguards – but there are also other more park-like areas where you can just wade into the waters. Strandbad Wannsee is known for its 1920s architecture and white sand. Müggelsee is the biggest lake in Berlin, and great for families as there’s lots of shallow areas. If you don’t want to travel too far out of central Berlin Flughafensee, Strandbad Jungfernheide and Strandbad Weißensee are all good choices. One of the best things about summer in Berlin is the sheer amount of festivals and celebrations – from massive parades to local and quirky festivals. You can check out what might be coming up for your visit here. Karneval der Kulturen is one of the biggest early summer festivals, celebrating Berlin’s cultural diversity with food stalls, a street party and a parade representing peoples from all over the world. Berlin Pride spans a week, usually in late July. The biggest day is Christopher Street Day, or CSD, which is when Berlin’s LGBTTIQ community parades from Kurfürstendamm to the Brandenburg Gate. It’s both a demonstration for equal rights, and a joyful celebration of rights that have been won, and everyone’s welcome to join in. Foodies might like to check out September’s Streetfood-mile at Treptower Harbour. Expect pavilions overflowing with a huge variety of cuisines, from fish balls and currywurst to organic ice cream.